For the first time since our country’s founding, we may be passing on a less prosperous and less free nation to our children and grandchildren. The United States has lost its S&P Triple A rating score for the first time in history. The United States has fallen from number 9 to number 10 on the International Index of Economic Freedom—going from a “free” to a “mostly free” nation. Congress raised the debt ceiling once again—boosting the debt limit to $16.4 trillion, which will pass on an even greater burden of debt to future generations. These sobering developments remind us that our country faces an uncertain future if we do not act. But with your support, we can take steps to prevent the further unraveling of our constitutional republic. The Heritage Foundation is the voice for America’s conservative principles. We tirelessly fight to restore the founding principles that made our nation strong. In fact, President Ronald Reagan, who led the United States during the largest peacetime economic prosperity in its history, relied heavily on Heritage for policy making and economic strategy. We need your help to continue battling the big-government, liberal agenda in this pivotal year. 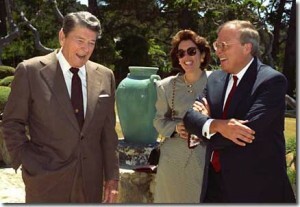 President Reagan with Heritage Foundation President Ed Feulner. Please join our fight today, and as a thank-you for your membership, we will send you a copy of Ronald Reagan: A Basic Introduction. This book will inspire you to follow in the principled footsteps of one of our nation’s greatest presidents. We must take a stand today to preserve a free America for tomorrow. Thank you for supporting the cause of freedom.